Founded in 1897, the Zionist Organization of America (“ZOA”) is the oldest pro-Israel organization in the United States. With offices around the country and in Israel, the ZOA is dedicated to educating the public, elected officials, media, and college/high school students about the truth of the ongoing and relentless Arab/Islamic war against Israel. ZOA is also committed to promoting strong U.S.-Israel relations. ZOA works to protect Jewish college and high school students from intimidation, harassment and discrimination, and in fighting anti-Semitism in general. 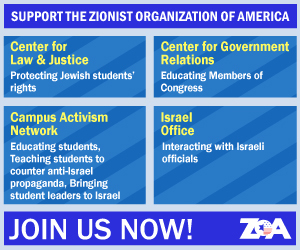 The ZOA’s growing ZOA Campus department provides resources, counsel, and support to students looking to build their knowledge about Israel and Zionism, and to those facing anti-Semitic harassment inside and outside the classroom. We provide free educational events, speakers, grants for programs, informational booklets, and fact sheets to enable pro-Israel education and programming on campus. Our campus coordinators, working with students on campuses around the country, provide hands-on support to students so they can carry out successful pro-Israel programs and effectively respond to anti-Israel speakers and events. The ZOA regularly brings student activists to Israel for leadership training programs; we are preparing the Jewish activist leadership of the future.